Carcross, originally known as Caribou Crossing, is an unincorporated community in Yukon, Canada, on Bennett Lake and Nares Lake. It is home to the Carcross/Tagish First Nation. 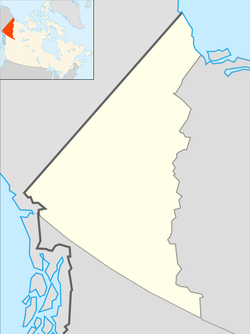 At the 2011 census it had a population of 289. It is 74 km (46 mi) south-southeast by the Alaska Highway and the Klondike Highway from Whitehorse. The south end of the Tagish Road is in Carcross. Carcross is also on the White Pass and Yukon Route railway. Caribou Crossing was a fishing and hunting camp for Inland Tlingit and Tagish people. 4,500-year-old artifacts from First Nations people living in the area have been found in the region. Caribou Crossing was named after the migration of huge numbers of caribou across the natural land bridge between Lake Bennett and Nares Lake. That caribou herd was decimated during the Klondike Gold Rush, but a recovery program raised the number of animals to about 450. Tour buses at a large tourist stop in Carcross. The modern village began in 1896, during the Klondike Gold Rush. At the time, Caribou Crossing was a popular stopping place for prospectors going to and from the gold fields of Dawson City. Caribou Crossing was also a station for the Royal Mail and the Dominion Telegraph Line, and it served as a communications point on the Yukon River. In 1904, Caribou Crossing was renamed Carcross as a result of some mail mix-ups with the Cariboo Regional District in nearby British Columbia. Silver mining was promoted nearby in Conrad, Yukon in the early 1900s, but there was little to be found and mining efforts soon ended. Mineral exploration continues today, but tourism is far more important to the economy of the community. The book Fractured Veins & Broken Dreams by Murray Lundberg details a nearly complete history of Conrad. Carcross relies on tourism to support the local economy. It lies on the Klondike Highway between Whitehorse and Skagway, Alaska and offers a variety of historic attractions and outdoor activities. 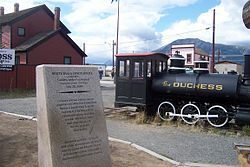 Popular with road traffic including tour buses and RVs, in 2007 the White Pass railway also resumed service to Carcross railway station. Just north of the town is the Carcross Desert, often referred to as the "world's smallest desert." There are two small airports located in the area, Carcross Airport is adjacent to the town and Carcross Water Aerodrome located on Tagish Lake. Alaska cruises stopping in Skagway will offer day tours to Carcross. The day tours offer stops at the Yukon sign, the Caribou Crossing Wildlife Museum, Dog Sledding Zoo and the actual town of Carcross. In winter, many businesses in Carcross close due to a lack of tourism. ^ a b c d e "Statistics Canada. 2011 Population and dwelling counts. Carcross, Settlement Yukon (Census subdivision)". Retrieved 23 October 2012. ^ a b c "Statistics Canada. 2001 Population and dwelling counts. Carcross, Settlement Yukon (Settlement)". Retrieved 23 October 2012. ^ "Carcross" (CSV (2874 KB)). Canadian Climate Normals 1981–2010. Environment Canada. Climate ID: 2100200. Retrieved 2014-02-20. Wikimedia Commons has media related to Carcross, Yukon. This page was last modified on 12 January 2015, at 04:29.